What a satisfying scene, engaging so many of the senses. The smells of the reeds and grasses and sun-drying wood, the lapping of the water, the urge to RUN down that path…and then??? This is really lovely, so inviting, and beautifully composed. 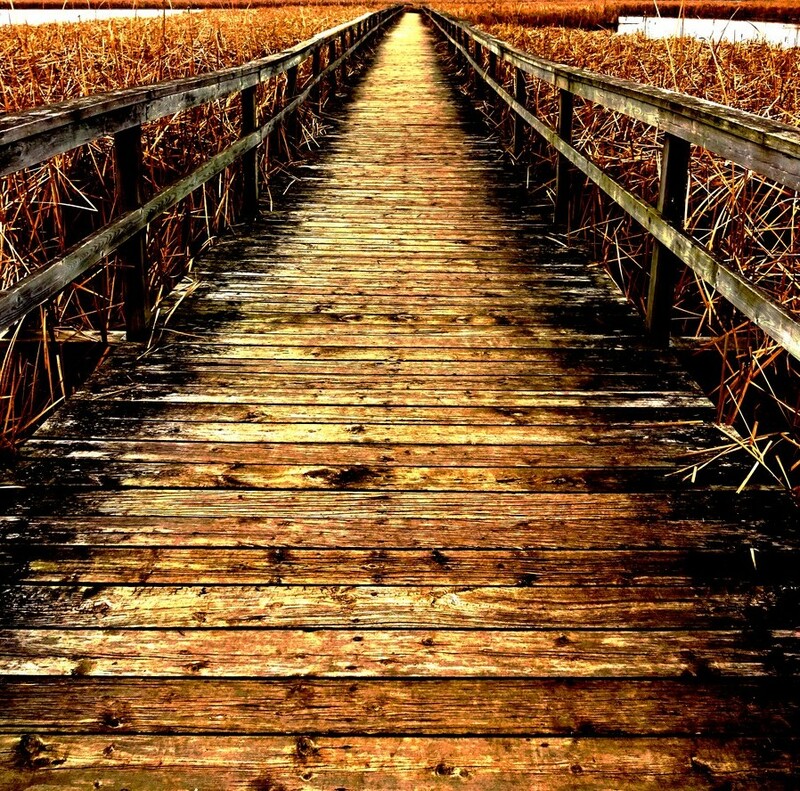 Ahhhh … where ever did you find this beautiful boardwalk, Carin? Fabulous pov and comp, but the tones you selected make it absolutely magical. I come here to walk sometimes, especially if I’m in the mood for birdly company. Gangs of wild turkeys in the woods! I have a thing about photos of bridges and boardwalks, paths and roads disappearing into the distance. Love them! This is wonderful — the texture of the walkway and how it beckons, the composition with emphasis on the path and not what’s at the end of it, the colour palette, the teasing hint of water. It looks more like a painting than a photo. I can smell autumn. Yes, yes, that’s it. The path! The end of it is merely another beginning. Yup, another one to love! This is such a wonderful classic example of the eye (and the foot) taking you into the scene, yearning to move forward and yet wanting to never reach the end with always more to look forward to. Your composition is brilliant, Carin. The horizon a strong, thin line at the top makes the boardwalk feel like a stairway to heaven. And the colours are so rich and warm I really feel like I’m in it. It reminds me a lot of Swan Lake Nature Sanctuary in Victoria, which is almost completely surrounded by roads and houses, yet still supports an amazing number of species. It’s a miracle how other species thrive in spite of our constant onslaughts. I’m glad your community was able to save this marshland.